This little alien went to Okadia. 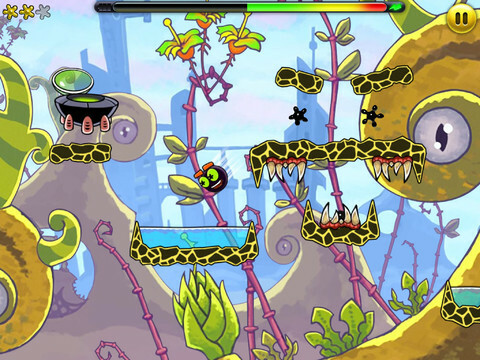 If you're in search of a fun puzzle platformer, consider downloading Jumpster from the App Store. 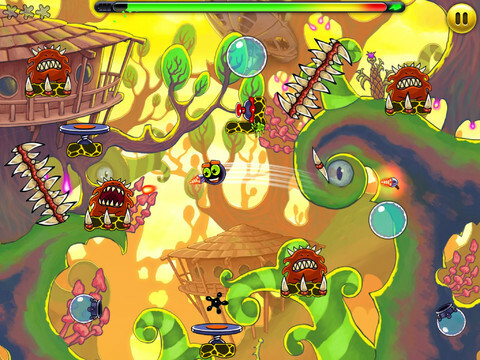 G5 Entertainment's freemium effort benefits from impressive graphics and gameplay, as you propel a tiny alien through hostile worlds overflowing with attractive 2D scenery. A heavy reliance on in-app purchases and a tricky fuel mechanic lessen the game's overall appeal, but considering the low price of entry, it's definitely worth a go. Story-wise, a cute extraterrestrial named Jumpster (original, we know) crash-lands on a strange planet after its ship sprouts a fuel leak. That said, the goals in each level involve collecting bits of precious fuel and getting Jumpster back to its UFO. You do this by placing a finger on the character, pulling back and then launching the creature, similar to Angry Birds, but there's a catch. Jumpster's energy meter depletes each time you make a maneuver that doesn't result in the alien landing in water, which protects it from massive energy loss. Run out completely, and Jumpster becomes immobile, forcing you to make one of two decisions: put the game down for a little while, waiting for a full or partial energy recharge, or fork over some cash to replenish it instantly. It's a strange setup that will likely turn off some players disinterested in opening their wallets. Thing is, G5 Entertainment wastes no time pushing IAP, with a variety of costume parts (wait until you see Jumpster with a mustache) and power-ups that cure many ills, from topping off energy to a shield that protects Jumpster against spikes and a respawn relic that lets players continue at the point before death, instead of restarting a level from the beginning. Despite the shameless sales pitch, however, you don't need to buy anything. In fact, so long as you make careful and calculated moves in-game, Jumpster's energy will be just fine, at least for several levels. Thing is, Jumpster is more than a money-making vehicle. It's actually a well thought-out platform adventure with imaginatively-designed environments and tricky stages full of cool set pieces, from spikes and breakable objects to monsters, trampolines and switches. To that end, we found ourselves addicted to the game's 80 levels. G5 went a little overboard on the IAP, but you don't have to spend a dime to enjoy what this title has to offer. What's Hot: Eighty challenging levels, sharp 2D visuals featuring four unique planets, respectable physics, numerous costume combinations, free-to-play. What's Not: Running out of energy renders Jumpster immobile, tough to earn lots of coins.